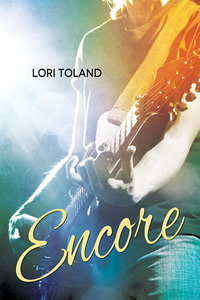 Many thanks to Lori Toland for donating an ebook copy of her freshly rereleased m/m romance, Encore (The Replacement Guitarist #4) (formerly known as Into the Light), for a lucky commenter to win! Their time apart has changed them, except the passion between them burns brighter than ever. With the media hounding them in the midst of multiple scandals, they find they can only depend on one person – each other. Will they learn to trust that their love is enough to see them through it all? Or will this be their final dance before calling it quits, this time for good? This gay romance was formerly known as Into The Light and contains less loving than previous books in the series but more anger and snark. It also contains some female lovin’, beloved character death and a possibly repentant pop star. To enter, leave a comment stating that you are entering the contest. Contest closes 7 pm CDT, Monday, September 15. By entering the contest, you’re confirming that you are at least 18 years old and that you can legally receive the book in the country in which you live. Posted by Chris on Tuesday, September 2nd, 2014, at 2:00 am, and filed under Contests, Reading. Please count me in. Who wins? Looks to me like they want something from you. Something BIG! Sigh, Blaze…please count me in! 😀 – please count me in. I enjoy this author’s writing and am obsessed with rockstar romances, so pretty please count me in for this! I have the others, and need to read the rest of this story! Please, let my internet be restored unto me, and let me win this, o Cat goddesses! Fanks! Subliminal messaging from cat staring: You will give us treats, yes your will power is weakening, you feel the need to go and get us some treats, yes you will, yes you will…. Count me in too! It looks great. Hmmm, I’ve never read anything from Lori. I’d love to read this one, though. Thanks for the giveaway! Looks like a great book. Please count me in .